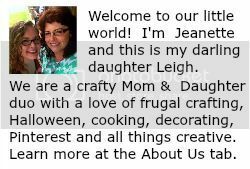 Last year we hosted a bridal shower for a dear childhood friend of Leigh's and we made a coffee filter wreath to use for the shower. The wreath did not have any decorations on it but was just perfect for the vintage country themed shower. Since then, it has been decorated for several holidays - Original Coffee Filter Wreath, Valentine's Day and St. Patrick's Day. This year, we went a little batty with it for Halloween! 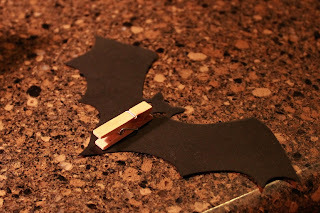 The bat die cuts came from the .99 cent store last year and we also added a few spiders suspended from thread. It all looks perfect with our Halloween Book Page Art from 2013. 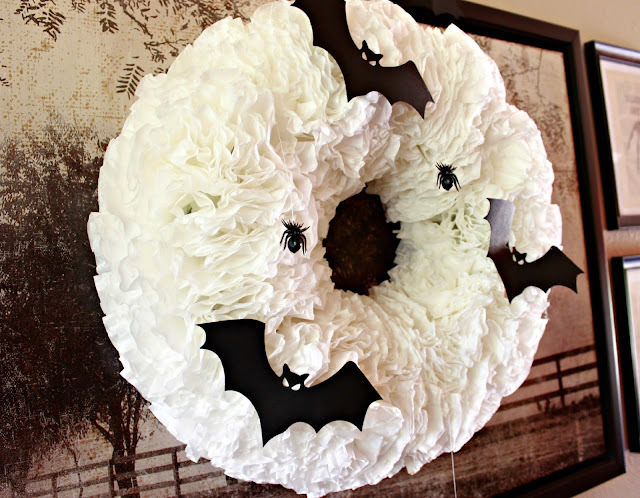 The bats were glued on to small clothes pins and pinned onto the wreath. 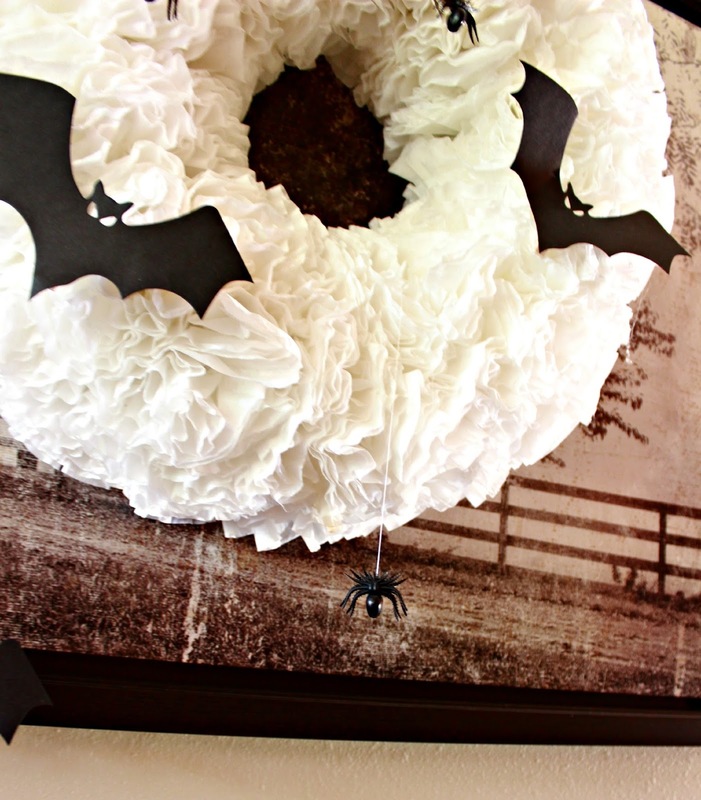 The thread that the spiders were suspended on was tied onto toothpicks and inserted directly into the foam wreath. The toothpicks are below the coffee filters so the thread looks like spider webs. Such a great look for a buck - don't you think? 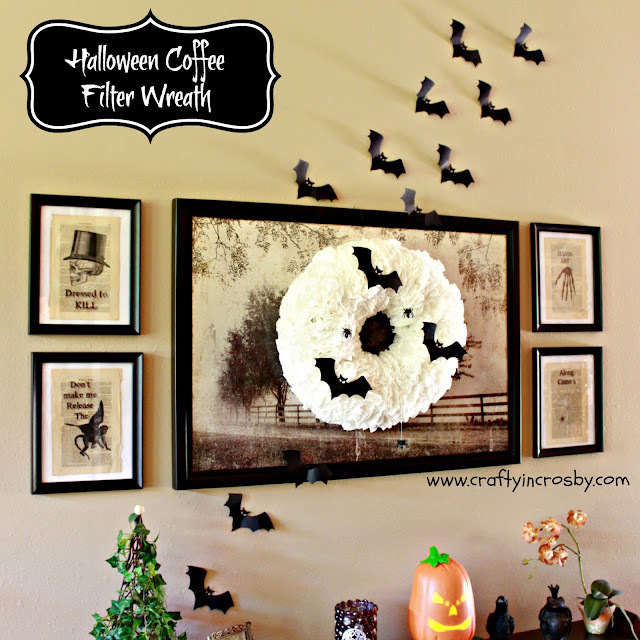 Our convertible coffee filter wreath will be around for years to come as it is so easy to decorate for all the seasons. Wishing you all a wonderful week of beautiful Fall weather! Love anything with coffee filters including your wreath! 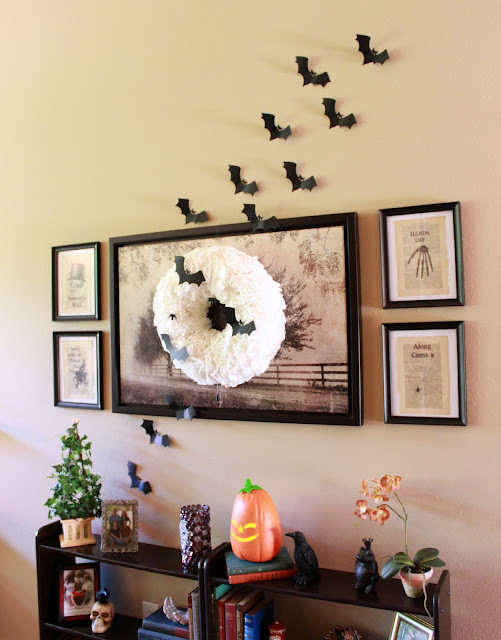 I'm all about repurposing, and love the idea! Thanks Debbie! 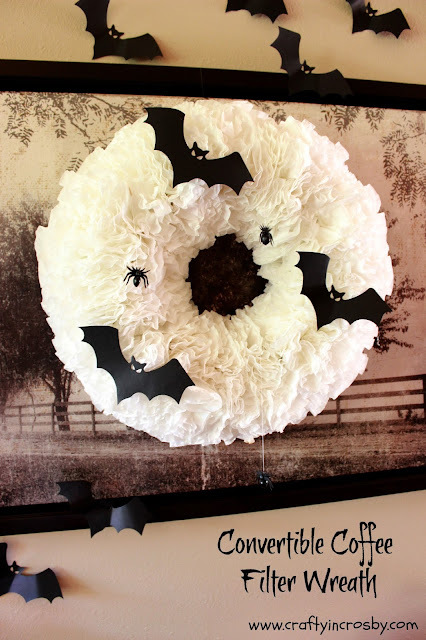 This is one of my all time favorite wreaths. It looks just as pretty plain as it does all dressed up. Thanks for stopping by and come back soon! Love it and I always have extra coffee filters! It is super easy to make one. Just need a styrofoam wreath, glue gun and coffee filters - that's it! Thanks for dropping in for a visit! this is soon adorable and really a great idea. Love love love that you can change it up for the holidays! Thanks so much Tiffany! My wreath collection has kind of gotten out of hand so I'm really enjoying having the same base to work with. Thanks for stopping by! This is so creative!! I love how you created a perfect tableau using everyday items! It looks fantastic, and I'm SO glad you shared it with us at Merry Monday!! Pinning and tweeting! !